Floral patterned jeans have become a major fashion trend recently and they are a trend which is much more appealing to me than the monochrome one which is being featured heavily. I first saw it last year on Kristin Cavallari and I was reminded of my love for it when I saw Julianne Hough in a pair today. I love how versatile the jeans could be - paired either with all black or even just a simple white top. Aimee Song's pair are perfect for spring/summer time but I feel like they could only be worn with light coloured tops - but knowing her she'll probably put up a post proving me wrong. 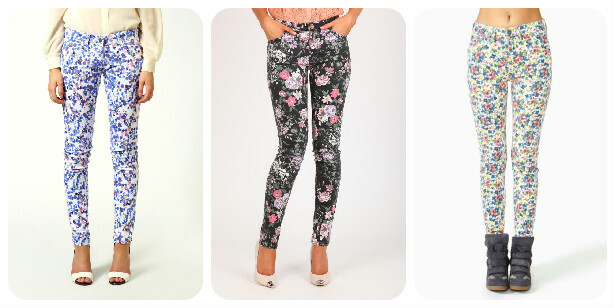 I was a bit apprehensive about the lack of versatility that I think I'd be able to get out of a pair floral jeans which are light like Aimee Song's but I really like the ones I found on Boohoo.com and for only £15 I think they are a worthy purchase.